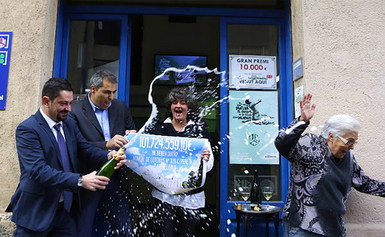 One of the most popular—and oldest—lotteries in Europe is the Spanish La Primitiva. With a €3-million guaranteed minimum jackpot, no cap on rollovers, and two draws per week, the bi-weekly La Primitiva offers a lot of things for lottery lovers to get excited about. As a result, it’s become something of a cultural phenomenon and tradition within the country, with 98% of Spain’s residents buying a ticket to it at least once every year. La Primitiva’s history goes a long way back—all the way to the mid-eighteenth century. This makes it one of the oldest lotteries known to mankind. In its early days, it went by a different name, Loteria por Numeros, which means “lottery by numbers,” and was developed as a clever way to generate funds for the Spanish Treasury. The first draw took place on December 10, 1763, and its format back then was very straightforward: players had to choose 5 numbers from a range of 1 to 90; there were no bonus numbers or anything like that. Though it enjoyed quite a bit of success over the years, in 1812 another lottery, the Loteria Nacional (translation: “the national lottery”) was introduced and Loteria por Numeros was renamed as La Primitiva (“the primitive one”). The Loteria Nacional quickly stole the spotlight, and in 1862 La Primitiva was abolished altogether. It vanished for more than a century, but made a triumphant return in 1985 when it was reintroduced to the public with updated rules. Its name, however, remained the same despite it no longer being so “primitive”, and the first draw of this new version of the game took place on October 17, 1985. Though the format has stayed mostly the same, a few changes have been introduced since then. The Reintegro ball, for example, didn’t become a staple of the game until June 1991. Playing La Primitiva is both simple and a little complicated at the same time. The main gameplay follows the very popular 6/49 format, meaning that players must choose 6 numbers from a pool of 1 to 49, which is easy enough. However, the game also has not just one but two bonus balls—one called the Complementario and the other the Reintegro—that can exponentially multiply two of the prize tiers. However, how the two balls function is a little bit different. The Complementario is a number that players choose themselves and, as the name suggests, is a complementary number. If the Complementario that is chosen (from the same drum as the main numbers) matches yours AND you happen to match all five of the primary numbers that were chosen, you will win the third-tier prize. Essentially, this prize multiplies—as many as 20 times!—the fourth-tier prize. Outside of this prize, however, the Complementario has no other effect. The Reintegro, on the other hand, is a number is that is randomly chosen for players. If you match all six primary numbers and the Reintegro, you will win La Primitiva’s grand-prize jackpot, known as the “Especial”. Since the prize money can grow to mind-boggling amounts, it’s definitely the main prize tier to aim/hope/pray/wish for. In addition, if the only number you match is the Reintegro, which literally means “refund” in Spanish, you will win a refund on the amount that you paid for your ticket. This fun feature is unique only to La Primitiva. The minimum jackpot is €3 million, but there is no limit to how many times the jackpot can roll over. That is why the top prize has reached stunning heights on numerous occasions and allowed La Primitiva to rank among the world's biggest lotteries. Altogether, there are seven possible prize tiers in La Primitiva, and the odds of winning the top prize, the “Especial Jackpot,” are 1 in 139,838,160. These odds aren’t easy by any means, but with the prizes regularly being in the dozens of millions of euros, no one would expect them to be. Coincidentally, these are the exact same odds as EuroMillions, whose jackpots can grow to even bigger amounts, while the odds of winning EuroJackpot, which has similar jackpots, are better (1 in 95,344,200). In contrast, the odds of winning other massive lotteries, including SuperEnaLotto (1 in 622,614,630), US Powerball (1 in 292,201,338), and Mega Millions (1 in 302,575,350) are much worse. The La Primitiva draws take place in Spain’s capital, Madrid, twice each week, at 9:30 pm CET on Thursday and Saturday evenings. All prizes are paid out in cash as a single lump-sum payment—no annuity option here. Your winnings may or may not be taxed, as this depends on the amount won. If you are a Spanish resident who wins €2,500 or less, you get to keep all of the winnings to yourself. If you win more than this, however, brace yourself because the Spanish taxman will take a pretty sizeable chunk of that—a whopping 20%! Luckily, foreign players are given a break in the form of a tax refund (phew! ), but you might still have to pay taxes in your own country, as some countries consider tax lottery winnings to be income, while others do not. The absolute best way to play La Primitiva online is through trusted lottery websites that offer security, convenience, and great features such as subscriptions, group play, and automatic verification of wins, prize claims, and payments into your player account. This takes all the guesswork and hassle out of the equation so that you can maximize the fun of playing the lottery while freeing up your time for other things. Spanish La Primitiva – Is It Worth Playing? If you’re still wondering whether or not to play Spanish La Primitiva, we have some advice for you: just do it. It’s an excellent game with exceptional primary and secondary prizes, as well as decent odds. In addition, the unique gameplay as a result of the Complementario and the Reintegro numbers gives this game some spice and a certain flair that stands out from other games. After all, which other lottery gives you a prize—let alone a refund on the amount you paid for your ticket—for matching just one number? Wow, thanks for explaining the difference between reintegero and complimentario!!! I thought for the longest time they were the same thing but now it makes sense. Like the detail you got in this review, and it's a great lottery too.